Struggling Manchester United star Alexis Sanchez has admitted he is running out of time to resurrect his career at Old Trafford after losing confidence under previous manager Jose Mourinho. Sanchez, understood to be the highest-paid player in the Premier League on £350,000-a-week, has a golden opportunity to shine against Chelsea and Liverpool this week because of injuries to Anthony Martial and Jesse Lingard. And the 30-year-old Chilean is aware he has to deliver. ‘I think a player like me has to show it right now. 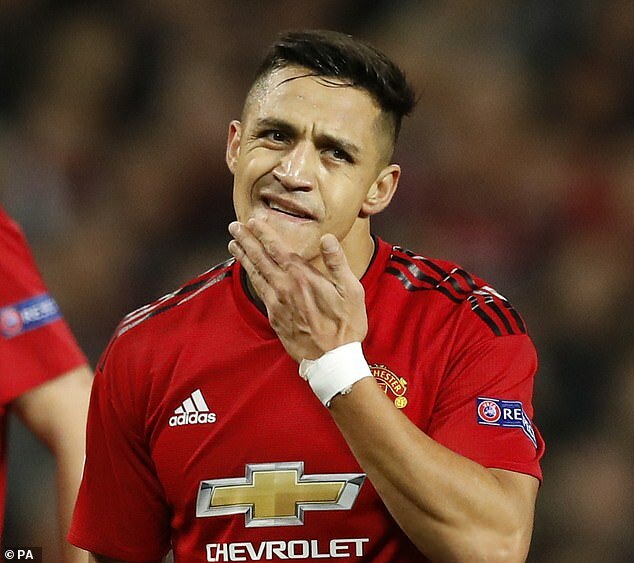 There is no time (to lose), nothing,’ said Sanchez, who has started just 18 league games for United since joining from Arsenal at the start of last year. ‘It worries me. I believe in what I am because it’s game over for a footballer who no longer believes in his ability but at the same time I’m hard on myself too. Sanchez has been hit by injuries and a loss of form since making world headlines by choosing United over Manchester City last season. His worrying dip started under Jose Mourinho, for whom he scored only four goals in 12 months and was sometimes left out the team. But he said: ‘In my opinion, Mourinho is one of the best coaches in the world, in the way he coaches and studies videos. But then, within the group, there was that feeling that you were in the team then out. ‘Sometimes I didn’t play, then I did, then I didn’t, and as a player you lose confidence. Each player lost their confidence and then an atmosphere was created that wasn’t healthy. Sanchez was in South America recuperating from an injury when Mourinho was sacked and Ole Gunnar Solskjaer brought in as interim boss. ‘I arrived [back] and the manager spoke to everyone, everyone was happy. Even the doctor started speaking, imagine that!’ he quipped. Even so, the managerial change hasn’t brought Sanchez an immediate change of luck. He has started only two games under the Norwegian and reveals he even took a knock from the linesman while waiting to come on as a substitute in Tuesday’s Champions League defeat against Paris Saint-Germain at Old Trafford. ‘I was on the touchline warming up and the referee’s assistant, when we had a counter-attack, came flying down the line and I had a foot there and he crashed into me — bang,’ he said. Sanchez’s honesty can be heard in an interview recorded for the BBC alongside team-mate Ander Herrera ahead of Monday’s fifth-round tie at Chelsea in the FA Cup — a competition he won twice with Arsenal. Herrera, an unused substitute when United won the trophy with Louis van Gaal in 2016, is also up for the Cup. ‘I like that song that our fans sing — “We are Man United and we’re going to Wembley”,’ he says.